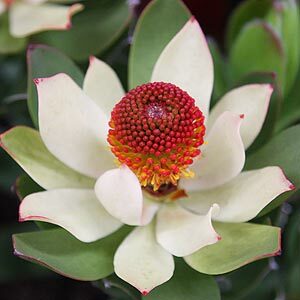 Leucadendron are originally from South Africa and are a hardy attractive flowering garden plant given the right growing conditions. Closely related to Waratahs and Banksias, they thrive in a well drained soil and sunny position. A medium to large evergreen, ornamental shrubs. Most are fairly drought tolerant, will grow in poor soils and do not need fertilising. Hybrids such as Leucadendron laureolum x strobilinum (pictured right) are forms with improved flowers and are an excellent choice for the garden border, they are also long lived as a cut flower or foliage plant. Leucadendron stelligerum Harvest makes a great low hedging plant as well as a good specimen plant. These plants require little care once established, check the soil ph as they tend to prefer a slightly acidic soil. Prune in late winter to early spring to keep in shape by removing spent flower heads, try not to cut back into old wood that has no growth, and generally give them a little tidy up. 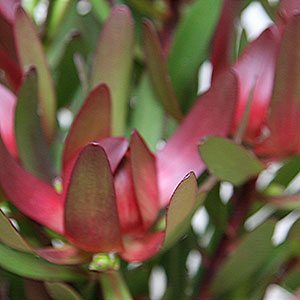 Leucadendron enjoy well-drained soil so mound the soil up before planting. Pruning will prevent the plant becoming straggly. Mulch plants to prevent weeds as they are a plant that does not tolerate soil disturbance. 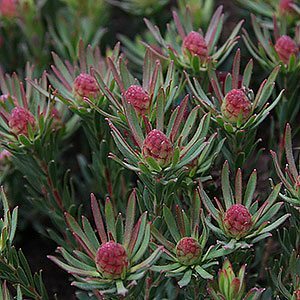 Varieties such as Safari Sunset provide excellent cut foliage and are a marvellous backdrop for perennials and native grasses while Leucadendron ‘Devil’s Blush’ can be used as a low hedging plant. All varieties enjoy full sun and plenty of air movement. Country of Origin – South Africa. Spread – Shrub to 1 metre plus. Foliage – Green to red depending on variety, elliptical in shape.. Flowers – Yellow to pinks and reds. The best time to prune is after flowering in spring and you need to prune fairly hard to keep the plants looking good. Prune back to around 12 cm or 5 inches from the base of the plant always leaving some good leaf growth. This will keep the plant nice and bushy. At the same time prune any dead or very spindly growth right back. Leucadendron are from the Proteaceae family a large group of plants from Australia and South Africa. Included are many useful garden plants, most suited to hot dry conditions, an excellent source of drought tolerant plants. Many species have been hybridized to create improved flower forms, and many are valued in the cut flower industry.